A garage has become an essential addition to our residence as it is not only used to park our vehicles, but also to be used as a personal workshop and storage room. This indoor shelter is often attached to the house or located in the residential compound area with electric operated remote-control doors. However, it can be really costly to hire workers to build a garage, compared to D.I.Y garages that cost cheaper. 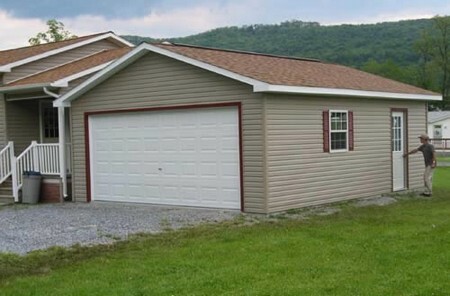 This article will tell you more about how to build a garage on your own. Before building the garage, you must have already acquired the permits needed for construction and a plan to follow. Extensions of the residence without permits are illegal. Next, order the raw materials that you will need for first part of the construction project. Perform periodical inspections before you proceed to order more materials. Bear in mind that you can always order a little extra just in case you need more. The leftover materials can be used to build up a barbecue place or a fireplace for you and your family. For the foundation, you might require some professional help if you do not have the equipments or skills to do it yourself. A garage requires a strong foundation so that it is durable and long lasting enough. Wooden forms are used as a frame and concrete will be poured into these frames. If you are planning to do it yourself, abide by the rules and have a local inspector around to ensure that you are doing things correctly. It would be best to hire a professional worker at this stage because they know best about the construction rules. Then, it is time for you to frame up the wall after completing the foundation. Get a few friends to help you with this task as you might need someone to hold on to the wall pieces when you are nailing them tougher. It would be easier to start with a wall with no openings. Double check the distance required in between studs. Wall pieces must be cut precisely to fit perfectly. Place the slabs at in their proper position and you may start nailing. Roof framing can be done by using prefabricated trusses or construct the roof by scratch. Prefabricated trusses are better for novice builders as it is all custom or ready made according to the measurements that you have provided. You will have to provide the accurate measurements and information on the slopes, length of overhang, load weight, the size of your beams and rafters. Confirm with your supplier to see if they can deliver the prefabricated trusses to your place. You may apply sheathing after your roof is installed. Windows and doors are then installed. You should order the correct size so that they can fit in. Lastly, apply finishing touches such as soffit, asphalt shingles and roofing felt. This is basically how to build a garage.